Passport power. 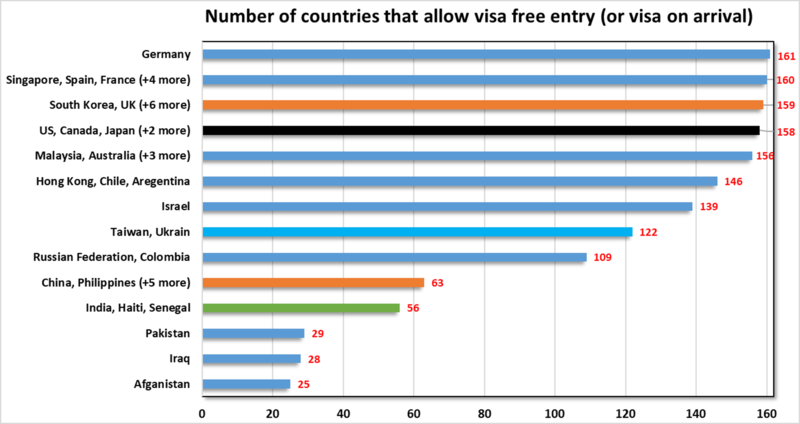 Number of countries that allow visa free entry (or visa on arrival) for various passports. Life of a traveler can be very different depending on what passport he or she holds. Germans can get into 161 different countries before applying for a visa, while those in US and Canada have that privilege to 158 countries. China, at 63, and India, at 56, are pretty low in this list. Your passport has a lot of power, or not, depending on which country’s passport you hold. If you hold one from EU countries then it can take you around the world without requiring much paperwork. US passport allows entry to 158 countries without a visa (or gets a visa on entry). However, few countries that do require a visa for US citizens include: Afghanistan, Brazil, China, Cuba, Iran, Iraq, Pakistan, Russian Federation, Saudi Arabia, Syria, and Vietnam. For China & India, most countries that allow entry without much paperwork are either neighbors or South-East Asian countries. That limits the ability to travel on short notice and can be very expensive due to hefty fees and requirements of pre-booked flights, lots of money in the bank, proof of intent to return, and even documents related to earning. Passport holders of China require an e-Visa (fully online application) to India. However, Indian passport holders can get a visa on arrival for layovers of up to 24 hours. However, US passport holders can get a visa on arrival for layovers up to 3 days. Surprisingly, both South Korea and Taiwan have made lot of progress in building global relationships and making it easy for its citizens to travel. A South Korean passport gets you into more countries than US (160 compared to 159 for US) and Taiwan gets into 122. On the other hand, countries with internal problems rank really low. Out of the 199 countries ranked by Passport Index, Afghanistan is at the bottom of list (at 25), behind Iraq and Pakistan. But it’s not all bad news. People restricted to travel to only few countries can sometimes find unique experiences in surprisingly different ways despite having a lousy passport.